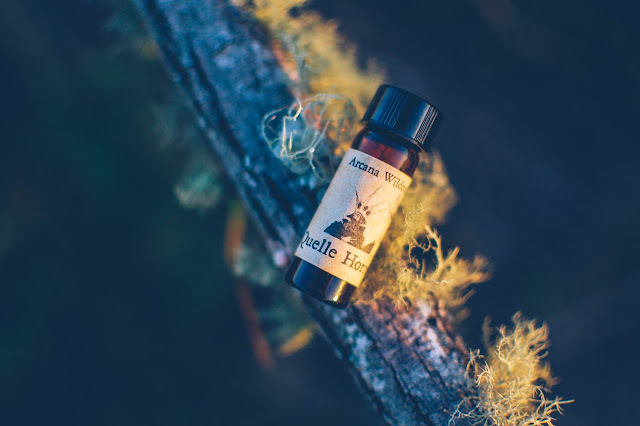 Quelle Horreur- Notes: Black musk, French tobacco, sweet ale, gardenia, sage and orris root. Only available as a 3ml as a gift with purchase. Moon white gardenia blooming under a tarry black orris night is the mirage that rises from the vial when inhaled. Graced on the skin, a leather pouch of dark sticky tobacco leaves rests on a mossy stone bench in a neglected French Quarter garden. Herbs, leggy and spindly, reseed themselves, propagating under silver strands of Spanish moss, chandeliers hanging from oak trees lit with fireflies. Creamy gardenias open up their tender hidden hearts to the gibbous moon. Tarry orris and black musk dwell in the shadowy corners and underbrush of the ancient garden where goblins and spites rustle in their warrens. An inky, almost creosote note comes from those mystical burrows. What happened to the soul who left behind the leather pouch? What is quelle horreur is that it isn't available in a full sized bottle for sale. I would buy it up lighting fast. This is one dark and magical southern gardenia and tobacco scent. It smells like an Anne Rice novel. 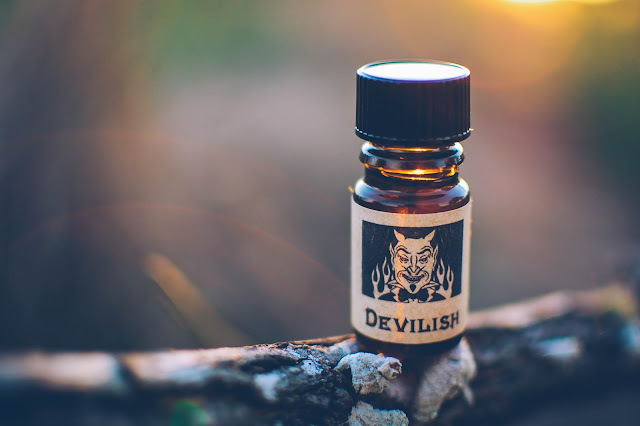 Devilish- Notes: Shaking off vanilla's reputation for namby pambyness, this infernally dark and smoky fragrance comes complete with licks of fire and sulfurous wafts of brimstone. The fumes from the bottle emit the scent of sumptuous vanilla smoke with a lick of honey fire. Crackling wet on the skin, this is the Devil's wedding cake, smeared with buttercream glowing with coals and flame. Tongues of fire licking at vanilla bean ice cream. This is what Calcifer the mischievous fire demon who dwells in Howl's moving castle smells like. More brimstone than campfire with a touch of that velvety incense that brings to mind Holy Terror. In the drydown the vanilla takes on a tonka bean richness that mimics whiskered vanilla woods. Something purring and sweet, yet naughty. 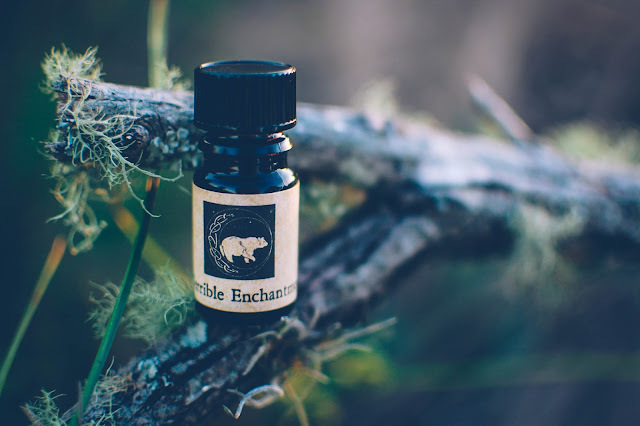 A Terrible Enchantment- Notes: The scent of a powerful curse created in the dark forest, with oudh, opium smoke, fir, pine, cypress and juniper. From the glass, blackest oudh and viscid opium burn in the dip of a slipware shard in an old growth forest of immortal trees that know no beginning nor ending. Brushed onto the flesh, fir and juniper boughs weave a camphorous wreath of scent that wraps around the limbs. As it dries, the base smells of dark and furred guaiacwood slivers and sticky smoky opium. Velvety and haunting. Slightly ominous. I adore it. Initially when I grouped these together for a photoshoot and review feature, I thought it was pretty random. But after testing and wearing and experiencing these scents I can see the common thread of moody darkness that unites them all. These are three very different but very noir perfume oils that will delight those looking for something a bit darker. You do like dark scents don't you?? I do too. I think you would enjoy these. I have already bought a back up of Quelle Horreur since it was only a 3ml. It should be here soon. 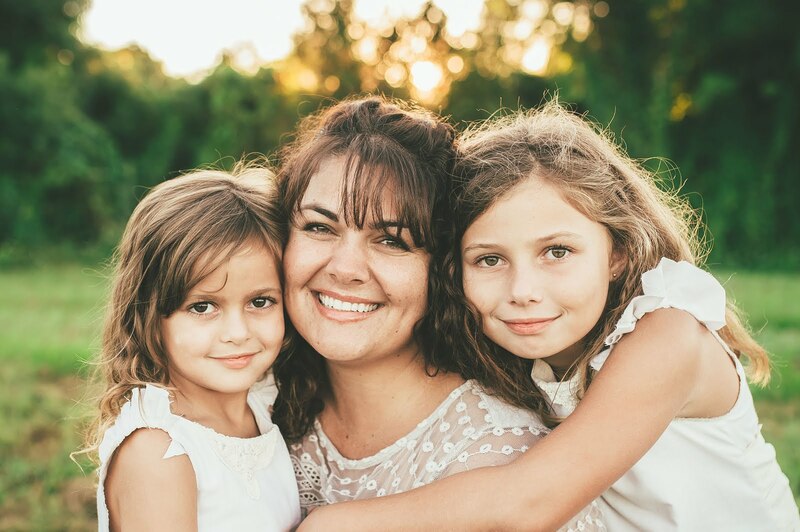 Thank you for reading and taking the time to talk with me about it. I know the perfume reviews can be a tad verbose but hey... I feel what I feel. :-) Hope you had a nice weekend and a good week ahead!